British researchers on Saturday unveiled a new theory for the origins of stonehenge, saying the ancient stone circle was originally a graveyard and venue for mass celebrations. The findings would overturn the long-held belief that stonehenge on Salisbury Plain in southwestern England was created as a Stone Age astronomical calendar or observatory. A team led by Professor Mike Parker Pearson of University College London said stonehenge, a UNESCO World Heritage site, is both older and had a different function than previously thought. “In many ways our findings are rewriting the established story of stonehenge,” Parker Pearson said. The archaeologists carried out a decade of research which included excavations, laboratory work and the analysis of 63 sets of ancient human remains. They said the original stonehenge appeared to have been a graveyard for elite families built around 3000 BC, 500 years earlier than the site that is famous today. 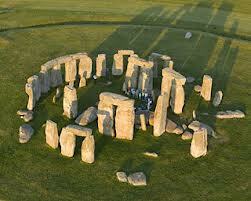 The remains of many cremated bodies were marked by the bluestones of stonehenge, Pearson said. Further analysis of cattle teeth from 80,000 animal bones excavated from the site also suggest that around 2500 BC, stonehenge was the site of vast communal feasts. It seemed that ancient people travelled to celebrate the winter and summer solstices but also to build the monument, he said. “stonehenge was a monument that brought ancient Britain together,” he said.